Pakistan President Asif Ali Zardari has met Malala Yousufzai in a United Kingdom hospital, describing the 15-year-old rights activist shot by the Taliban as a 'remarkable girl'. 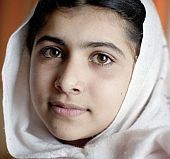 Zardari, accompanied by his daughter Asifa Bhutto, met Malala on Saturday at the Queen Elizabeth Hospital in Birmingham where she was being treated after being shot in the head on October 9 by the Taliban for advocating girls' education in the strife-torn Swat valley. A statement released by the University Hospitals Birmingham NHS Foundation Trust said President Zardari, along with Asifa, met doctors who have been treating Malala since her admission to the hospital on October 15. "They were brought up to date on the 15-year-old's medical progress and her future treatment plan by (the trust's) medical director, Dr Dave Rosser," the statement added. President Zardari and Asifa Bhutto then had a short five-minute private meeting with Malala, her father Ziauddin and her brothers Khushal Khan and Atal Khan. The President appreciated the courage and conviction of Malala and described her as a 'remarkable girl' and a 'credit to Pakistan'. He also thanked the hospital staff for their outstanding care. The Taliban had said that she was targeted for espousing secularism and Western ideals. Doctors said the bullet grazed the teenager's brain when it struck just above her left eye. She was flown to Birmingham to receive treatment unavailable in her own country. Tens of thousands of people have since then signed a petition, seeking a Nobel Peace Prize for Malala.